The Empire Hotel & Country Club is one of the world's most-up-to-date, fully integrated luxury resort built in the tradition of which Brunei Darussalam has become renowned. The hotel, comprising of a series of intimate hotels, is luxuriously appointed to provide the highest level of accommodation and personalized service. These distinct accommodation precincts adjoin the South China Sea and a Jack Nicklaus designed eighteen-hole Golf Course, offering spectacular views. Also incorporated within the resort are a Country Club, The Empire Theatre and Cinema Complex, a Sports Complex, Beach Facilities, distinctive Food and Beverages outlets and an upscale Retail Shopping Arcade. Sheraton Utama, Brunei’s only boutique-style internationally branded hotel is the epitome of connectivity, warmth and comfort. 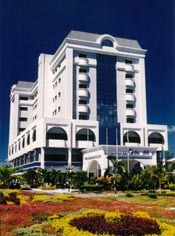 Conveniently located in the historical centre and the heritage of Brunei, the Hotel is within walking distance from most of the country’s unique attractions such as the “Water Village”, locally known as Kampong Ayer, The Royal Regalia Building, Brunei History Centre, Sultan Omar Ali Saifuddien Mosque as well as an international-class shopping complex. The hotel is also connected to nature’s reserves; the Tasek Lama Recreational Park with a pocket of rainforest, natural waterfall, children’s playground and a jogging trek. 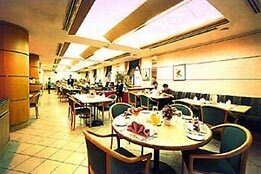 The hotel is renowned for the comfortable overall atmosphere as well as the variety of the culinary offers such as great steaks and a sumptuous selection of buffet. Relax in the comfort of your room overlooking the scenic view of the city or the garden view and experience the celebrated Sheraton Sweet Sleeper Bed. Enjoy the new lifestyle by the poolside in our vibrant day-beds or for total relaxation, pamper yourself with a rejuvenating spa treatment. For the ultimate five-star bliss with the perfect location and superior service, stay at the Sheraton Utama Hotel. Rizqun International Hotel is a 5 star business class hotel located 10 minutes away from the Brunei International Airport and it is located right in the hub of business and shopping district of Gadong. It consists of 168 rooms and suites with 4 food & beverage outlets. It also has the biggest pillar less ballroom with a maximum of more than 1000 pax in anyone seating is the biggest in Brunei . Wireless internet connection in lobby and restaurants. The Holiday Lodge is located just 5 minutes walking distance from Jerudong Park Playground, it is approximately 15 minutes from Brunei International Airport and Bandar Seri Begawan. With 107 fully air-conditioned rooms, - 100 Standard rooms, 3 Deluxe rooms, 3 Executive Suites and 1 Penthouse. Mills Coffee House is an all day dining restaurant with air-conditioned indoor seating, serves local, regional and international specialties. Private dining room and theme buffet dinners available during weekends and public holidays. The All Star Sports Cafe promises a fun time for everyone, the only sports theme restaurant in Brunei with the funfilled American Cafe concept offering a wide range of western meals, beverages, creative mocktails, enjoy good music, table games, dart and friendly crew members. The Havana Club Cigar Divan, set in elegant surroundings, is the perfect place to indulge in the finest Cuban and Dominican cigars, admist the soothing sounds of Latin-American music. An exclusive array of accessories and imported Coffees for Cigar Aficionados are available. 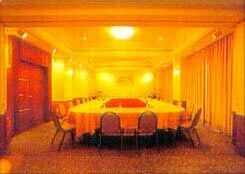 Our meeting room can accommodate up to 150 persons and it is divisible into 2 rooms. It is a perfect place to cater for small and medium functions and events. Our banquet team is equipped and capable to handle various type of outside catering functions. Le Gallery Suites Hotel, a unique boutique hotel, situated in the heart of Jalan Tutong, 15 minutes away from the airport, conveniently accessible to the banks, shopping areas and other local points of interests. 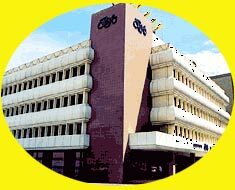 It offers friendly and artistic ambiance coupled with reasonable rates to suit your budget. Guest may choose from a variety of rooms and suites all complete with private bathrooms and full amenities such as air-conditioner, color television and refrigerator. We offer business centre services with wireless internet access and wide range of secretarial services. Guests may also walk around the hotel area simply to appreciate the uniquely and selective choice pieces of artworks artistically done by some of our young and budding artists. Strategically located between the Brunei international airport and Brunei government offices, the 164 room Orchid Garden Hotel is within walking distance of Brunei's premier sporting facilities. The Hotel looks out on the International Convention Centre (ICC), the largest meeting facility in Brunei. The Hotel provides with a range of meeting venues and facilities to care for your business and social gatherings. The typical room is designed with all the comforts of home in mind and the larger suites include the fine appointments and tasteful furnishings that will make your stay a comfortable one. The function rooms and the hall can accommodate a variety of functions, ranging from 20 to over 1,000 people. It is the ideal place to hold meetings, seminars, exhibitions, weddings, annual dinners and spectacular product launches. Experience culinary delights where East meets West in Goldiana Cafe & Lounge. Alternatively, come to Vanda Chinese Restaurant to whet your oriental appetite and savour authentic and ingeniously crafted Chinese cuisine. You may prefer to meet in our restaurants, where we provide a choice of Western, Asian, Malay and Chinese cuisine. 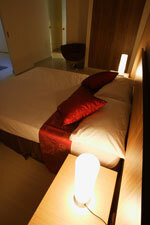 Or simply relax in the comfort of our well appointed rooms and suites. Whatever you decide, when in Brunei you should experience our hospitality that comes with a touch of heart. Located just 10 minutes from the Brunei International Airport and two commercial districts, Riverview Hotel offers modern comfort for both leisure and business travelers. Each guest room features colour television, IDD telephone, air conditioning with individual controls, mini bar, radio and TV with bed side panels, hairdryer, safe deposit box, satellite TV, coffee and tea making facilities and message indicator. 7 meeting rooms are available to cater for every type of meeting and dinner. Riverbank Cafe features a variety of local and international cuisine - open 24 hours. Kirin Court Chinese Restaurant features seafood, Cantonese cuisine and dim sum. Seri Pelangi Swimming Pool Complex features specialty - barbeque and steamboat daily and during the day, light snacks and ice cream are served. Outdoor Swimming Pool with Giant Slide and Cascading Waterfall. Sauna and Jacuzzi Spa Pool. 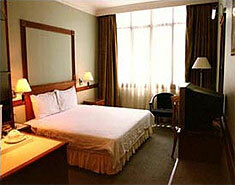 The extra bonus is the warmth, hospitality and friendliness of the highly trained staff. They are here to serve you and to help to make your stay in Brunei enjoyable and memorable. 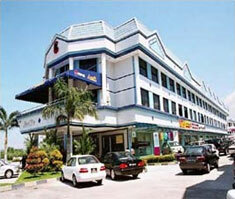 Grand City Hotel is a new property situated close to Bandar Seri Begawan airport. Part of a busy shopping area, it is surrounded by small shops, restaurants and street side cafe's. Tastefully furnished rooms, convenient access to nearby shops and excellent value for money pricing has made Grand City very popular amongst tourists and business visitors. Set within a popular shopping area the hotel is five to ten minutes drive from the airport, five minutes drive to the Centrepoint Mall shopping area and cinema complex, and ten minutes drive to central Bandar Seri Begawan. Major credit cards accepted, safe deposit box, laundry service, internet connection, Free WiFi at the Lobby, telephone, and facsimile services & free car parking.